Bitcoin dropped below $US6,000 earlier in the session . LONDON – Ethereum’s steep price fall continued on Tuesday as the entire cryptocurrency market continues to fall. Ethereum is down just over 10% to $US253.35 at 4.22 p.m. BST (11.22 a.m. ET). 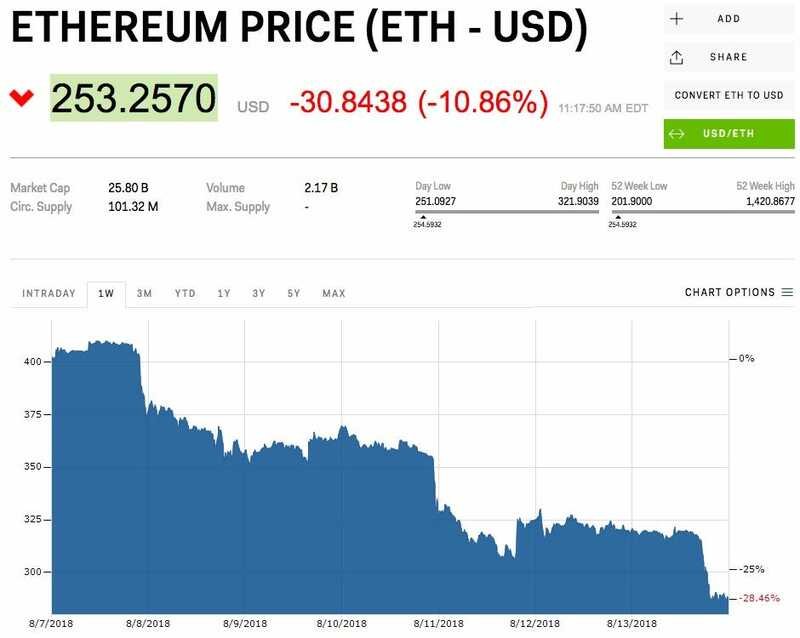 The current sell-off began on Monday, when Ethereum dropped to an 11-month low. Bloomberg reported that the slump was sparked by startups that had raised funding in ethereum through so-called initial coin offerings (ICOs) now cashing their holdings into traditional fiat money they can spend on development. As of Tuesday morning London time, the value of the overall cryptocurrency market had fallen by about 10% over the past 24 hours, according to CoinMarketCap.com, from $US218 billion to $US193 billion. Bitcoin, the largest cryptocurrency by value, dropped below the psychologically significant level of $US6,000 early in the session before fighting back. Bitcoin was down 3.7% to $US6,020.24 at 4.24 p.m. BST (11.24 a.m. ET). “Ultimately USD and US Treasury notes are the only real safe harbour,” Wilson said.